LaunchPad, our online course space, combines an interactive e-Book with high-quality multimedia content and ready-made assessment options, including LearningCurve adaptive quizzing and coded machine-gradable exercises from the textbook. Content is easy to assign or adapt with your own material, such as readings, videos, quizzes, discussion groups, and more. LaunchPad also provides access to a Gradebook that offers a window into your students' performance—either individually or as a whole. Use LaunchPad on its own or integrate it with your school’s learning management system so your class is always on the same page. 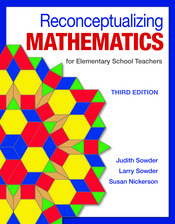 To learn more about LaunchPad for Reconceptualizing Mathematics, Third Edition, or to request access, go to launchpadworks.com.